Sarah Palin unlawfully abused her power as governor by trying to have her former brother-in-law fired as a state trooper, the chief investigator of an Alaska legislative panel concluded Friday. The politically charged inquiry imperiled her reputation as an ethics reformer on John McCain's Republican ticket. Investigator Stephen Branchflower, in a report for a bipartisan panel that investigated the matter, found Palin in violation of a state ethics law that prohibits public officials from using their office for personal gain. The report said Palin played an active role in a vendetta against the trooper, Michael Wooten, involved in a bitter divorce and custody battle with the governor's sister. Branchflower said Palin violated a statute of the Alaska Executive Branch Ethics Act, which states, "… each public officer holds office as a public trust, and any effort to benefit a personal or financial interest through official action is a violation of that trust." The inquiry also looked into her dismissal of Public Safety Commissioner Walter Monegan, who said he lost his job because he resisted pressure to fire Wooten. Palin says Monegan was fired as part of a legitimate budget dispute. The investigation revealed that Palin's husband, Todd, who is not a state employee, has extraordinary access to the governor's office and her closest advisers. The report said that he used that access to try to get Trooper Wooten fired, just days after Palin was elected but before she took office, and that there is evidence the governor herself participated in the effort. The report found that Palin let the family grudge influence her decision-making even if it was not the sole reason Monegan was dismissed. "I feel vindicated," Monegan said. "It sounds like they've validated my belief and opinions. And that tells me I'm not totally out in left field." Branchflower also said that the Attorney General's office failed to "substantially comply" with his request for e-mails related to the case. After a delay in locating more than 200 e-mails from several employees in Palin's office, the Attorney General notified investigators that he was asserting privilege over them. "[she] knowingly permitted a situation to continue where impermissible pressure was placed on several subordinates in order to advance a personal agenda, to wit: to get Trooper Michael Wooten fired. She had the authority and power to require Mr. Palin to cease contacting subordinates, but she failed to act. "Such impermissible and repeated contacts create conflicts of interest for subordinate employees who must choose to either please a superior or run the risk of facing that superior's displeasure and the possible consequences of such displeasure. This was one of the very reasons the Ethics Act was promulgated by the Legislature." As the report underscores, "Compliance with the code of ethics is not optional." 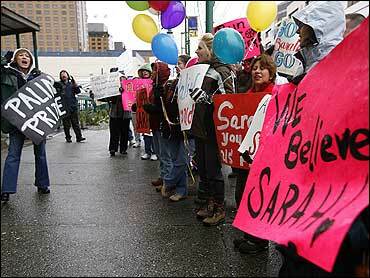 Sarah Palin refused to grant an interview to investigators, after originally agreeing to participate. In July she had welcomed the investigation, telling reporters, "Hold me accountable." She said at the time that there was never pressure put on Commissioner Monegan, and that she had "absolutely nothing to hide." After being named to the McCain ticket in late August, however, she ceased cooperating [as did many of her staff who were subpoenaed], as the McCain campaign besmirched the impartiality of the bipartisan investigation. Branchflower wrote that an interview with Palin "would have assisted everyone to better understand her motives," and explain why she allowed the pressure to fire Wooten to continue unabated for several months, even after knowing the trooper had already been disciplined and that his casebook was closed. The report said that Palin has the constitutional authority to hire and fire executive branch department heads. Branchflower said that Monegan's refusal to fire Wooten was "likely a contributing factor to his termination as Commissioner of Public Safety," but that it was not the sole reason. As a reason for terminating Monegan, Palin offered what she termed his "rogue mentality," an example of which was his work with a Republican state legislator to seek funding for a program that she had previously vetoed. Monegan, a former Anchorage police chief who was hired by Palin shortly after she took office, testified that he received repeated communications against Trooper Wooten's employment. In one case in August 2007, the governor had found out that Wooten was to work "light duty" at the state fair - in costume as "Safety Bear." Despite the fact that Wooten would be unrecognizable in the mascot's outfit, Monegan received a call from Kris Perry, director of the Governor's Anchorage office, saying they had learned Wooten would attend at the same time that Palin was to put in an appearance. Monegan testified that he then suggested to Wooten's supervisor that the trooper not be assigned to the fairgrounds, offering as a reason that the bear costume might restrict his vision or ability to move. When asked if the reason Monegan had Wooten switched off the state fair duty was over concern for the trooper's health (because of the confining suit) or some other reason, Monegan replied that he was more worried about his own health. "Your employment health?" the investigator asked. The report notes that the governor "lost confidence" in Monegan when, on the eve of this year's annual Police Memorial Day ceremony in May, he forwarded her a poster of a trooper holding a flag for her to sign and present at the event, not realizing that the photograph was of Trooper Wooten. Palin cancelled her appearance. Palin and McCain's supporters had hoped the inquiry's finding would be delayed until after the presidential election to spare her any embarrassment and to put aside an enduring distraction as she campaigns as McCain's running mate in an uphill contest against Democrat Barack Obama. Several Republican state legislators went to court last week to try to block the release of the legislative council report, and appealed to the state Supreme Court when their request was denied. The high court affirmed on Thursday that the courts should not block the report. In addition to the nearly 300-page report, another 1,000-plus page report containing confidential personnel information was also presented to the legislative committee, which voted that it not be released. When asked by CBS News correspondent John Blackstone whether the documents not made public might help explain why the governor abused her power, State Representative Peggy Wilson, a Republican, said, "That's probably a very good way to put it." Trying to head off the potentially damaging report, McCain campaign officials released their own report Thursday that stated Palin was clear of any wrongdoing. But the panel of lawmakers voted unanimously to release its official report, although not without dissension. There was no immediate vote on whether to endorse its findings. "I think there are some problems in this report," said Republican state Sen. Gary Stevens, a member of the panel. "I would encourage people to be very cautious, to look at this with a jaundiced eye." The report does not recommend sanctions or a criminal investigation; lawmakers don't have the authority to sanction her for such a violation and they gave no indication they would take any action against her. "It is out of the Legislative Council's hands. It goes to anyone's hands who got a copy or clicks the link on the Web," said Democratic state Senator Kim Elton, the chairman of the committee that released the report. "I can't tell you how the process ends." Under Alaska law, it is up to the state's Personnel Board, not the Legislature, to pursue the governor's violations of ethics laws. The Personnel Board is made up of three members who are appointed by the Governor. One of the board's members was re-appointed by Palin when she took office; another contributed to her gubernatorial campaign. If action is approved, the board must refer the matter to the Senate president for disciplinary action. Violations also carry a possible fine of up to $5,000. An attorney for Palin disagreed with the findings. "In order to violate the ethics law, there has to be some personal gain, usually financial. Mr. Branchflower has failed to identify any financial gain," attorney Thomas Van Flein said. On The Early Show, GOP strategist Ed Rollins said that, with the McCain campaign "sputtering," the Troopergate revelations are just "one more little thing." He focused on the report's finding that she did not overstep her authority as Governor in firing Monegan. "There's no evidence she did anything improper in firing the commissioner. She can fire anybody in her cabinet she wants to." Democratic strategist Kiki McLean, however, said, "I think most people have probably already settled on their opinion on Sarah Palin about whether they want her to be one heartbeat away." Wooten had been in hot water before Palin became governor over allegations that he illegally shot a moose, drank beer in a patrol car, and used a Taser on his stepson. In proceedings revealed by the report, former Alaska State Trooper Col. Julia Grimes told investigators that Sarah Palin called her in late 2005 to discuss why Wooten hadn't been fired, and Grimes told her the inquiry was confidential by law. "Her questions were how can a trooper who behaves this way still be working," Grimes said. "I asked her to please trust me, that because I can't tell her details I would ask her to please trust me that I would take the appropriate action if and when I knew what the findings were. ... I couldn't have another conversation with her about it because, again, it's protected by law." Grimes said Todd Palin also contacted her by telephone in late 2005 to discuss the confidential investigation of Wooten. Wooten's disciplinary case was settled in September 2006 - months before Palin was elected governor - and he was allowed to continue working as a trooper. After Palin's election, her new public safety commissioner, Monegan, said he was summoned to the governor's office to meet Todd Palin, who said Wooten's punishment had been merely a "slap on the wrist." Monegan said he understood the Palins wanted Wooten fired. "I had this kind of ominous feeling that I may not be long for this job if I didn't somehow respond accordingly," Monegan told the investigator. For months afterward, Todd Palin filed complaints about Wooten, saying he was seen riding a snowmobile after he had filed a worker's compensation claim and was seen dropping off his children at school in his patrol car. Monegan said Wooten's doctor had authorized the snowmobile trip and his supervisor had approved his use of the patrol car. Monegan said Alaska's attorney general later called him to inquire about Wooten, and Monegan told him they shouldn't be discussing the subject. "This was an issue that apparently wasn't going to go away, that there were certainly frustrations," Monegan said. "To say that (Sarah Palin) was focused on this I think would be accurate." On Saturday, as Sarah Palin boarded the campaign bus in Johnstown, Pa., a reporter shouted out a question, asking if the Governor had abused her power. "No," she responded, "and if you read the report, you'll see that there was nothing unlawful or unethical about replacing a cabinet member." Campaigning in New Hampshire on Saturday, Todd Palin refused to comment on the report. He was in the state for the New Hampshire Snowmobile Association's annual grass drag competition.